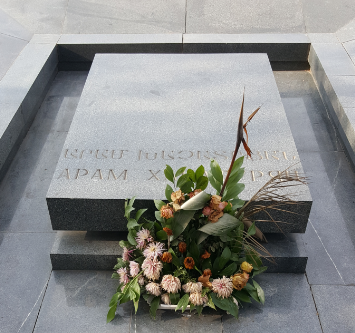 I realized that I promised you a post WEEKS ago about famous Armenians and my visit to the Komitas Pantheon where a bunch of them are buried. Well, before I talk about leaving Armenia, I need to make good on my promise! My trip to the Pantheon was part of a day full of adventures, and it ended up being one of the highlights! I didn’t even know it existed until blog friend Lori the Naz made the suggestion… sometimes the internet can be a wonderfully cool thing! 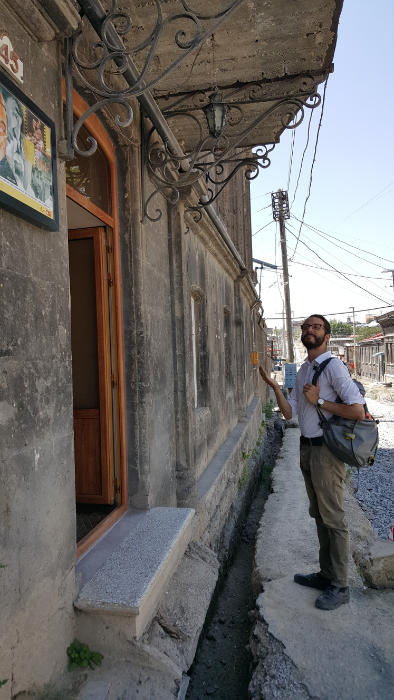 During my time in Armenia, I learned a lot about the different Armenian cultural heroes. It’s kind of awesome how much the arts are prized there. For example, all of the money features scientists and artists and writers instead of politicians like the U.S. money. 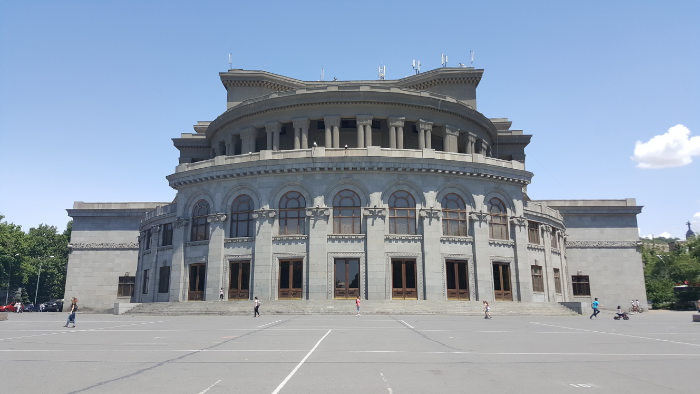 Of course, Armenia doesn’t have hundreds of years of presidents to choose from, but still, it’s a nice concept. They’re updating the money this year and maintaining that theme. 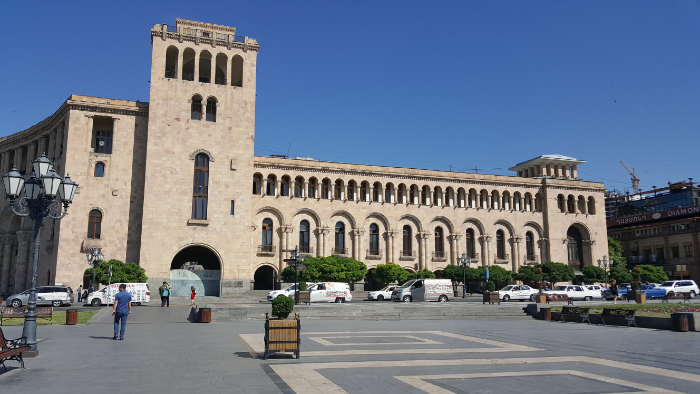 The new bills will have a writer, a composer, a painter, St. Gregory (first head of the Armenian Apostolic Church), and a former chess world champion. Chess, you ask? It seems random, but people often joke that the national sport is chess, partly because Armenians generally aren’t the most athletic (though there is one very good wrestler at the moment, so it’s not unheard of), but also because there’s such a big emphasis put on it. The great chess players are celebrated like professional athletes are in the States. Chess class is mandatory in schools for kids aged 6-8! You can see old men playing chess in every park in the country. In the realm of more traditional arts, music has always been a big focus area for Armenians. One of the best parts of going to the opera/ballet all the time was hearing the orchestra play. There are SO many amazing Armenian musicians. I met someone from Lebanon recently who joked that every single musical instrument teacher in Lebanon is Armenian. 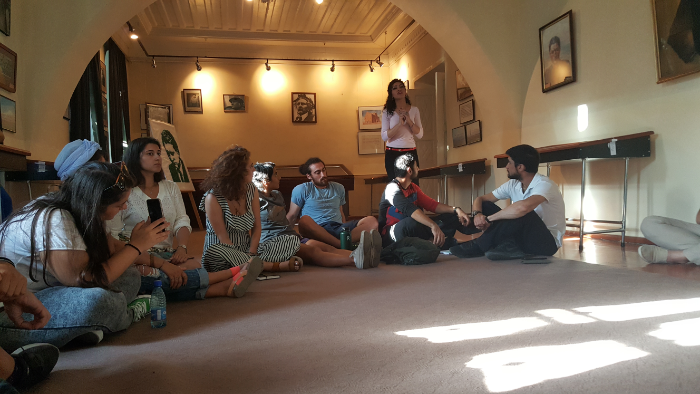 In summary, simply put, the arts are one area where the Armenians are doing pretty darn well. 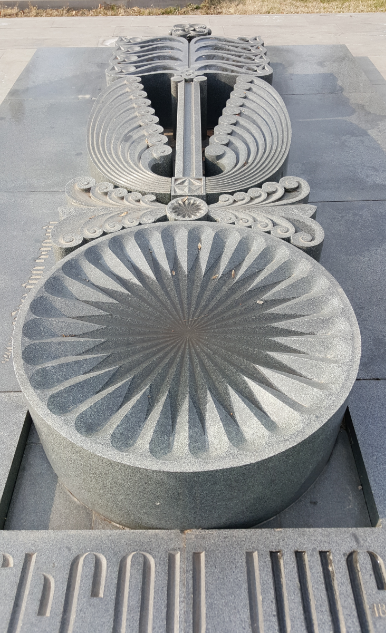 It might seem like that was a big sidetrack, but it’s important to understand the role of the arts in Armenia before I talk about the people who are buried at the Komitas Pantheon. They are some of the most celebrated Armenians, and the majority of them are artists of some kind. Khatchaturian is one of the most celebrated Armenian composers. He was born and raised in Tbilisi, but make no mistake, he was definitely Armenian! He composed multiple concertos and symphonies, plus the music for the ballets Masquerade, Gayane, and Spartacus. I went to see Masquerade and Spartacus, and they were both incredible (the music part at least). I also was amazed by how many of the songs I had heard before, and that’s because some of his work is pretty mainstream, not because I’m some Armenian music savant. Let’s start out with what I consider to be an essential fact… Komitas’s real name was Soghomon Soghomonian. No wonder he changed it. 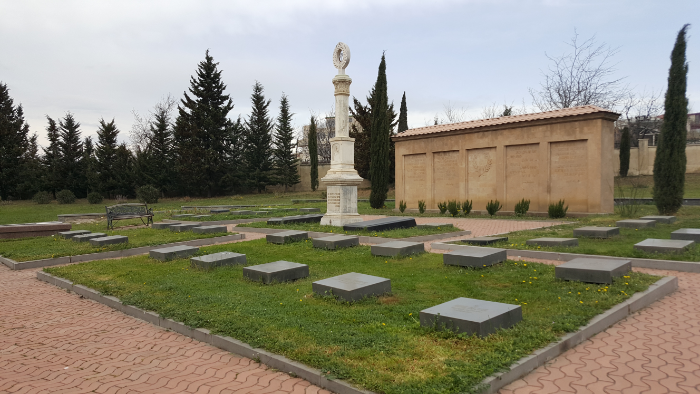 Komitas was an orphan and was taken to Etchmiadzin to be raised in the seminary there. He became a priest and then also studied music in Germany and is credited with saving thousands of Armenian folk songs from oblivion by collecting and transcribing them. He was known for his sense of humor and acted in many comedy roles, but he also had a true talent for acting and starred in a number of dramatic Armenian classics. He had an Armenian nose (aka it was very big), and he frequently joked about that. I don’t know what it is about artists and having complicated lives, but similar to many others, despite his professional success, his personal life was a series of unfortunate events. His wife was diagnosed with a mental illness and lived the rest of her life in an institution, his son had the same illness, and his daughter died in a car accident at age 39. He may have been a funny guy, but he spent the end of his life in a deep depression. 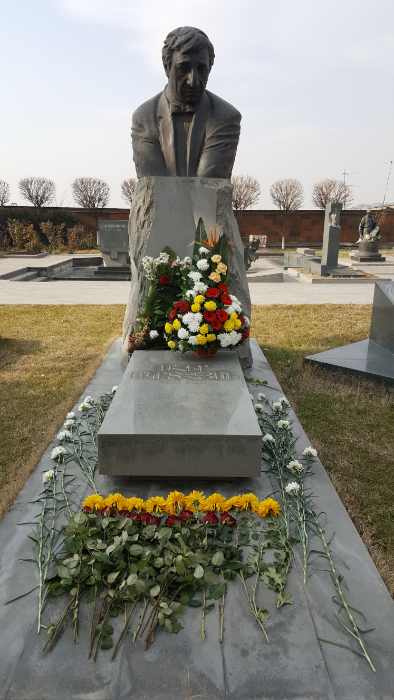 I wrote a detailed post about Parajanov here when I visited his museum with a friend. He was quite the interesting guy, so I’d recommend checking out that post if haven’t already or don’t remember. One-second summary is that he was a filmmaker during the Soviet years, he was imprisoned multiple times for made up reasons, his films were aggressively censored, and he funneled his creative energy into hilarious collage-making as a side activity (the “hilarious” part is not objective… that’s based on my personal opinion). Saroyan was a writer of novels, plays, and short stories. As is the Armenian way, the claim is that he is underrated, and his name belongs alongside those of Hemingway, Steinbeck, and Faulkner. I haven’t read his stuff, so I can’t speak to that, but I can say that that’s the most Armenian thing I’ve ever heard. It sounds like he was one of those slightly difficult artists… there was one project where MGM wanted to adapt a novel based on his childhood into a movie, and he was hired to help with the screenplay but refused to let them cut anything out. He was fired, and one day before the film was released, he released a novel of HIS version of the screenplay. After that, he refused to let his work be adapted into movies. 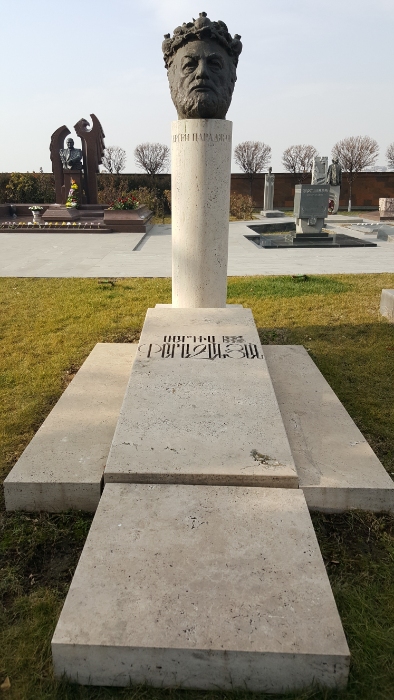 He was born in the US, so half of his ashes are buried there, and the other half are in Armenia. Saryan was a painter during Soviet times. He wasn’t born in Armenia, but after he visited the country, he painted a ton of Armenian landscapes and also designed the coat of arms for the Soviet state of Armenia. Near the end of his life, he moved to Armenia, continued to paint, and also organized what is now the National Gallery of Armenia. 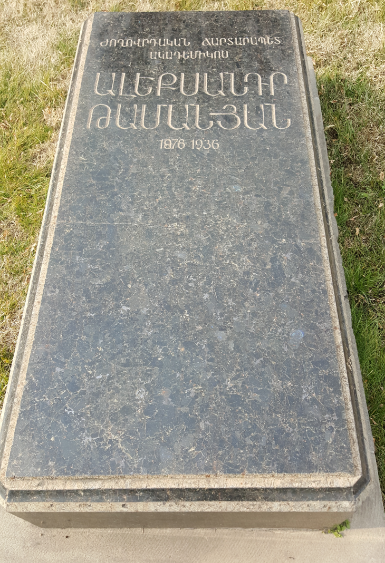 Shiraz was a poet from Gyumri, and he is considered to be one of the greatest Armenian poets of all time. We read a bunch of his work as part of Armenian class to celebrate his birthday, and I got to read this depressing poem about apricot trees and how they can’t have children and no one loves them or something to that effect. Uplifting, for sure. My understanding is that he wrote a lot about apricots, his mother, and Armenian patriotism. 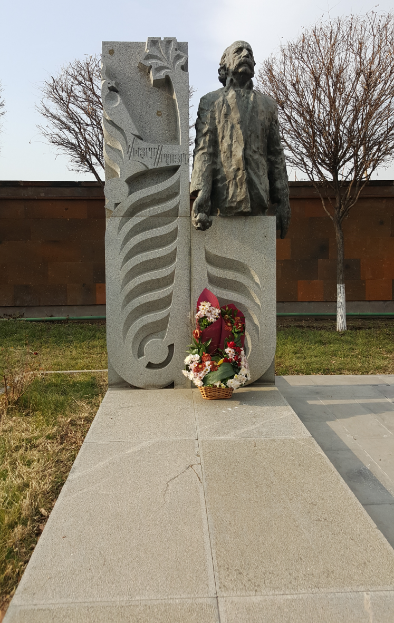 Tamanian was an architect and urban planner during Soviet years who was responsible for creating the master plans for cities all over Armenia including Gyumri, Stepanakert, and the current center of Yerevan. I don’t know how I feel about him exactly, but I don’t think he’s my favorite. In the 1920s, Tamanian designed a new city center for Yerevan than resulted in the destruction of a lot of historic buildings, and they were replaced with these semi-European-looking buildings. To me, it’s like they’re not European and they’re not Armenian, so why?? The most famous buildings he has in Yerevan are probably the ones around Republic Square and the Opera House, and I’m not too keen on either of those. It could be because the exterior night lighting for both is terrible, or maybe I actually just don’t like the architecture either. It’s hard to separate them. Mariam and her sister, Yeranuhi, were both painters born in Gyumri. I went to their museum when I lived there, and they have some interesting stuff. Mariam is referred to as the “Armenian Frida Kahlo” because of her style, but don’t ask me who gave her that title. She did more than just paint… she also did a lot of ceramics work and various random other handcrafts. 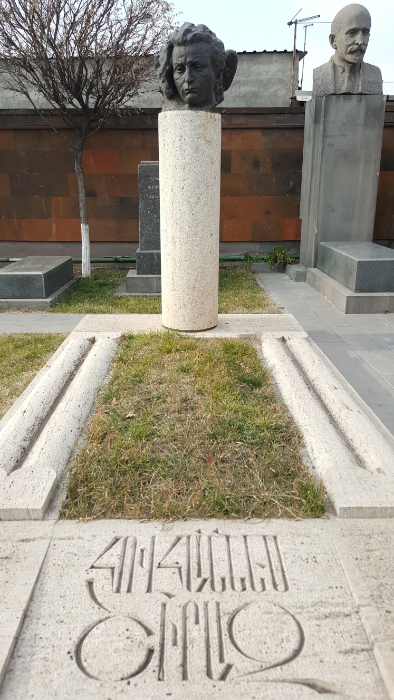 There are a couple of people I want to talk about who aren’t buried at the Komitas Patheon, but I came across their graves in Georgia, and I feel like this is an appropriate time to bring them up. Not to be confused with Tamanian, Tumanyan was a poet who is even more of a big deal than Shiraz. He didn’t stop at poems though, he also wrote novels, ballads, fables, etc. 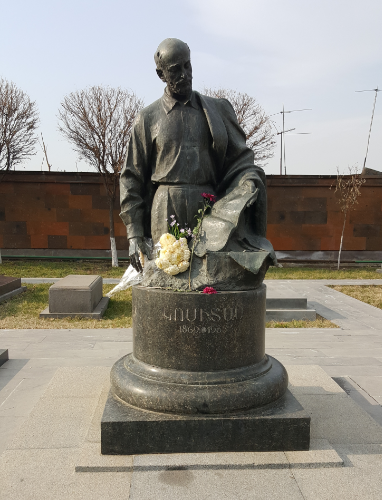 He’s the one who wrote the rhyming version of the Armenian epic about David of Sassoun (which I talked about when I visited the Sasuntsi David statue). 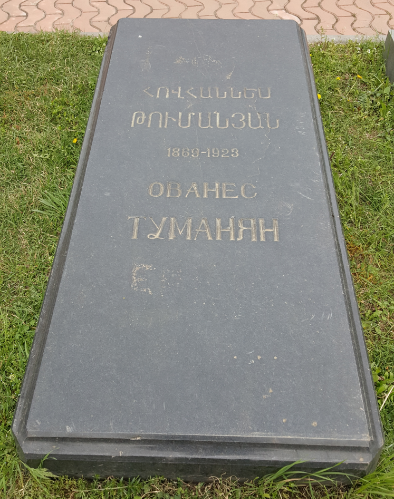 Tumanyan lived much of his life in Tbilisi, Georgia, so it makes sense that he’s buried there. 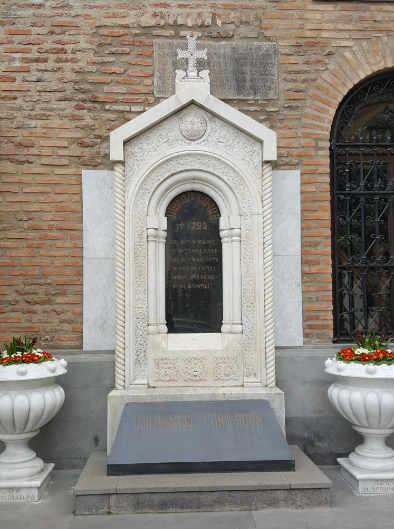 His grave is in the Armenian Pantheon in Tbilisi, just outside of the Holy Trinity Cathedral. 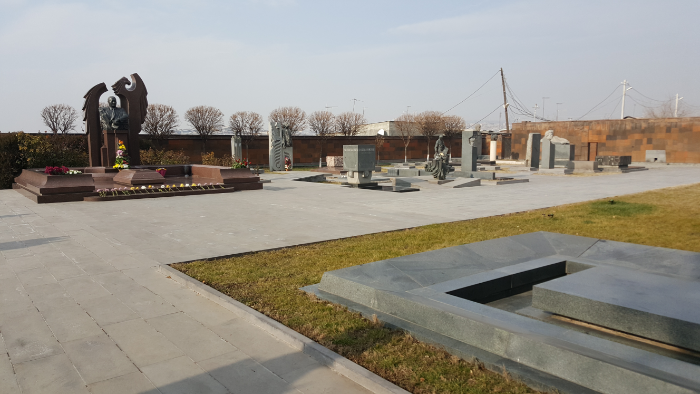 It used to be part of a huge Armenian cemetery there which was destroyed despite Armenian protests during the construction of the cathedral. I’m not sure if his body is actually underneath the gravestone or not because it sounds like things really got messed up during the demolition which is unfortunate. Officially, he’s credited with writing 220 songs, though the real number is almost certainly much higher. He was killed after refusing to convert from Christianity to Islam. Sergei Parajanov directed a movie partly about him, The Color of Pomegranates. Okay, so now you know more half-facts about famous Armenians than you probably ever wanted to know. You’re welcome. I promise I won’t do this to you again. Feel free to read up elsewhere on any of these people and then tell me what a mess of a job I did giving their mini-biographies. Wow! How cool that you actually made it here! This and the Tumanyan museum are my favorite spots in Yerevan. I like that you in each of their credits you included who appears on what form of currency. 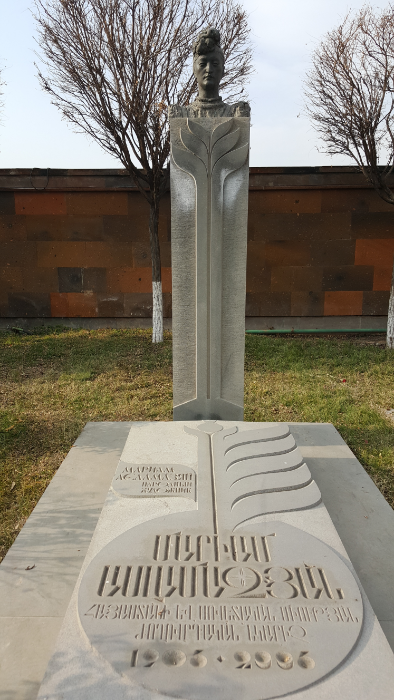 I really want to go to Georgia to see the resting place of Tumanyan and Sayat Nova. I’ll be traveling to Armenia in a few weeks and thanks to your adventures I’ve added so many places to my “to do” list! I’ve been meaning to ask where you took the old time photo with your cousins? I’m curious if I’ll be able to talk my family into doing a family portrait. Thank you so much for the suggestion!! I seriously wouldn’t have even known it existed without your recommendation. I feel like it’s weird to say that I loved visiting a graveyard, but it was like a museum. And Georgia is awesome. Very different and very similar to Armenia, so it’s an interesting experience. We went HERE for the pictures. I just emailed them ahead of time to make a reservation. My cousins say that was one of their favorite parts of the trip, so if you can convince them, it’s definitely a lot of fun. And the pictures are hilarious.